Wionews: As India will celebrate its 72nd Independence Day on Wednesday, Prime Minister Narendra Modi will address the nation from the ramparts of the Red Fort. This will be his last Independence Day address before next year’s general elections. 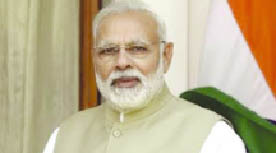 In the hour-long address, Modi is expected to present the report card of his government – a promise he made while addressing the nation after becoming the prime minister in 2014. PM’s address is likely to focus on the achievements of his government, said sources. PM Modi is expected to lay before the nation the agenda for 2019 elections, sources added. Development will be the focus of PM’s address tomorrow. He is also expected to speak about employment, Clean India, issues concerning farmers, and infrastructure development with special focus on roads, airways and ports. With a new regime taking over in Pakistan, PM Modi is likely to touch upon the contours of India’s policy towards its neighbour. On July 30, Modi spoke to Imran Khan, who is set to become Pakistan’s next prime minister after his party emerged the largest political party in July 25 polls, and hoped that democracy will take deeper roots in the neighbouring country. The celebrations for the 72nd Independence day will be held at New Delhi’s Red Fort. Special traffic arrangements and restrictions imposed in the national capital starting Monday. To maintain vigil, the Delhi police has installed additional CCTV cameras, especially at major markets of the national capital. Security has been beefed up across the city as a precautionary measure. Security has also been tightened at other major points in various states, including Assam and Punjab. In Amritsar, police are undertaking stringent security check at railway stations, bus stands, and hotels.